A. How much food do you need? The Canned Food Alliance recommends the minimum amount of food is two cans of food per person, per day and one gallon of water per person, per day. For most disasters, we recommend a minimum of three days preparation. This should include a sufficient food supply and a minimum of one gallon of water per person per day. A health crisis – like a pandemic flu – requires longer-term planning. There is a real possibility grocery stores will need to close to help prevent the spread of the disease. The Washington Departments of Health and Emergency Management recommend preparing for these types of disaster for a minimum of one week. When you complete one week’s preparation – consider preparing for two weeks. What should your emergency food supply include? A variety of canned meats, canned fruits and vegetables, grains, canned milk products, ready-to-eat canned foods, and soup. So, the next time you are at the grocery store, pick up two extra cans of food for your Emergency Food Supply. Remember – the minimum amount of food is two cans of food per person, per day and one gallon of water per person, per day. Quick update: This article pertains to long-term stored food. Food that has an expiration under 3 years should be actively rotated in your day-to-day food preparation. The food that you hide away should have a shelf life of 10 years or longer. There is a lot you can improvise when you are a knowledgeable, skilled prepper. Among what you cannot improvise is food, water, and firearms. As I have suggested in previous posts, a single person should store at least 3 months of food and a family should store at least one year’s worth of food. These are minimums. And I recommend that you continuously build up your food storage program until you reach three years of stored food. Why three years of stored food? In the first year after the collapse, you need to lay low, hunker down, and try to remain unnoticed, until the mass die off occurs. You need a second year of food to survival through your first planting season. Your third year of food is a buffer for garden mistakes and drought. Or your third year of food will feed the family members who suddenly show up on your doorstep. Or you can donate your third year of food to charity after the collapse. Or swap some long-term stored food in exchange for fresh items, such as eggs or milk. Or you can barter food in exchange for goods and services. I can easily foresee paying someone in food to take overnight security watches. Of the first year of stored food, I recommend that it consists of canned and dried food that your family commonly eats. This would include canned tuna, canned beans, canned fruits and vegetables, dried pastas, breakfast cereals, etc. It is important to rotate this food, so that none goes to waste. First in is first out. Stack the newer items towards the back and the older items towards the front of the shelves. This way you grab the oldest items first for your daily meal preparations. The 2nd and 3rd year of stored food should be long-term stored food. This includes dehydrated food, freeze-dried food, and food buckets with grains and beans. The storage life of this type of food should be at least 10 years, otherwise put the food into your daily rotation. So where do you store all that food? One to three years of long-term stored food takes some serious storage space. Take a tour of your home to find any dead space. Dead space is in the interior of your home which has no functional use. 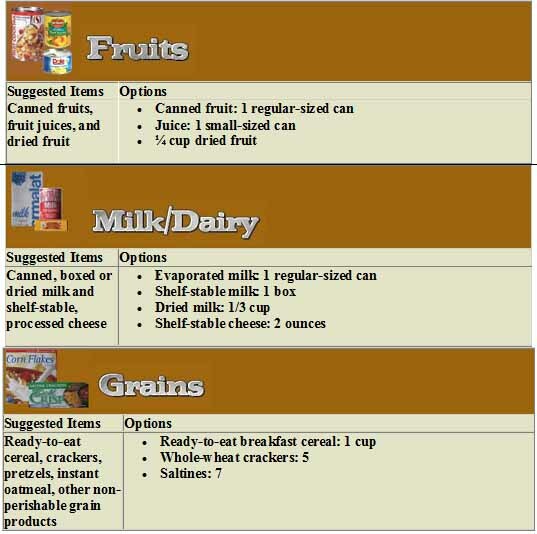 a) In your food pantry – When I look in people’s kitchen pantries, I often see non-food items. People will put extra pots, pans, and kitchen gadgets in their kitchen pantries. Or paper supplies. Clear out everything except food from your kitchen pantry. You can stack canned goods up to 3 deep and 3 high on the shelves in a pantry. Your first goal of a food storage program is to fill up your everyday kitchen pantry. 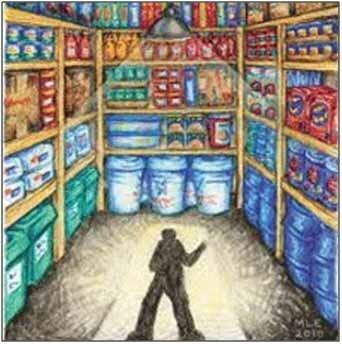 Do not buy long-term stored foods, until after your kitchen pantry is filled with everyday foods. Beans and canned meat such as spam have long shelf lives, often up to 5 years. Canned salmon and sardines can have a 7 year shelf life. The key to filling your kitchen pantry is a rotation plan. Have a system that prevents you from eating the new items. One of your weekly tasks is to go into the kitchen pantry to find what is nearing expiration. Whatever is nearing expiration is your dinner tonight. b) Under beds – this is a nice dark and cool space. Under beds are perfect for #10 cans. Buy a bed frame which can be elevated just a bit to accommodate boxes containing #10 cans. My daughter was told one of her friends that her daddy stores rice under her bed. Bad OPSEC on my part. I forgot to instruct my daughter to not talk about stored food. c) Behind the head-board of your bed. Pull out your bed from the wall just far enough to store food buckets. Stack up food bucket to the height of the head-board, then throw a shamee or other covering on top of the buckets to make the space presentable. d) Closets floor space – the space on the floor under need the coats and linens. e) Closet shelf space – often there is dead space high above a closet shelf. You can stack boxes sometimes fairly high above the shelf. Test the shelf to see if it can support heavy weights. f) Under desks – My home office desk has spare space for food buckets and boxes. g) Under bathroom sinks – often the space is unused. Make sure any food stored under a sink is in water proof containers, in case of water over flow. h) Under coffee table – some coffee tables have dead space underneath. i) Garages – Only store food in a garage if cool enough in the summer. If your garage is shaded and does go above 75 degrees in the summer, then you can store some items in your garage. This is a good place for large bulk A galvanized steel garbage can will hold lots of grains and beans. j) Under stairwells – Often under the staircase, there is dead space. k) In an extra, unused bedroom – I have an extra bedroom, which serves as my home office. In the closet of my spare bedroom, it is stacked with lots of stored food. Behind my desk are food buckets. No guest are allowed into my home office (man cave), so I don’t give a darn about appearance. l) Underneath a sofa with hide-away bed – often there is unused space there. Or unscrew the pull-out bed to give you lots of spare space. m) In the basement – whether you have a finished or unfinished basement, block off a corner of the room to stack boxes. n) In the laundry room – Due to humidity in the laundry room, make sure any items are waterproof sealed. o) Behind couches – Due to the tilt of the back of a couch, there is often dead space at the rear bottom of a couch. p) A mud room or utility room – If you have such a room and it is cool year round, this is perfect for stored food. 2. At your bug-out location. If you have a cabin up in the mountains or a vacation home, store extra food there. 3. Store food with other family members. If you are on good terms with a family member, agree to store food for each other as a back-up. Then if you need to retreat to that family member, some of your food is already there. 4. Store food with good friends and neighbors. If a good, reliable friend or neighbor whom you trust, who also have extra storage space, then this might be an option. 5. Store food with your survival group. One of your survival group members is likely to have extra storage space or a basement. 6. Store food in a rental storage unit. This is a good option if you do not have close-by friend and neighbors. You should never keep all your supplies in just one location, in case your primary home is destroyed. If you do not have a bug-out retreat, the rent a storage unit within walking distance of your home (under 5 miles). Find a storage unit which is well shaded and does not get direct sunlight. You are looking for a cool place to store food. Some storage units get very hot in the summer. Heat is the enemy of stored food. If you can afford it, rent a temperature stabilized unit Some storage units specialize in storing wine or art, which must be temperature controlled. A temperature control unit is ideal, but more expensive. Also make sure the storage unit is accessible when there is a power outage. When you need the store food the most, there will likely be a power outage in your home town. 7. Store food at work. If you own your own business or have a dedicated office which you can lock, then storing food at your place of business is perfect. 8. Start a food storage program at your place of worship. Many places of worship have lots of unused basements and closets. If your place of worship has like-minded survivalist, then start a food storage program. 9. Storage caches on your property. If you can build a proper storage cache to bury or hide on your property, this can be a place to store lots of food. Search youtube.com for southernprepper1, who has very good advice on this subject. 10. An underground shelter is an excellent option for food storage. If you live in a tornado area, then you should have a storm shelter. Store food under the benches or on shelf spaces in your storm shelter. 11. If you have farmers in close proximity to your home, establish a direct food purchase relationship with the farmers. One of the best way to keep beef fresh is on the hoof, live and ready. You are storing future food in that direct farm relationship. 12. Nuture the wildlife around your home. Perhaps set up a salt lick or feeding station for deer. Find locations around your home where there a lots of rabbits and squirrels. Have small animal traps and a 22 LR rifle for hunting small game. 13. Obtain books that describe the wild foods in your region. Within a mile of your home, you can likely find dozens of wild foods. While this is not technically hiding your food, but perhaps you hide the wild food book. (I know this is a stretch on this topic. But hopefully you get the point. 1. Do not store food in the attic. The summer heat in the attic will likely cause any stored food to go bad. 2. Do not store food in crawl space. Crawl spaces often take too much heat in the summer and susceptible to rodents. 3. Do not bury food, even if in sealed, water proof containers. Ground water will eventually rot the containers. Or the containers can collapse under the weight of the earth. Or rodents or other animals will chew through. Or you will lose track of the location. 4. Sheds and barns – Gets too hot in the summer and attracts rodents. 5. Do not store any food near fuels and other chemicals. I do not store any food in the places where I store extra fuel. 6. You not store extra food in your fat belly. If you are over-weight, you have a duty to your family to trim down. An obese person will live 6 years less, on average, than a person with normal body weight. Do not deprive your family of your love and presence in those last 6 years. 7. At the Grocery store – Time and time again, the pattern is the same. An announcement of a pending large storm sends everyone scrambling the groceries stores. Groceries are then stripped bare within 24 hours. Then groceries stores are not replenished until long after the storm has gone. Do not rely on getting to the grocery store at the last minute. Instead at the last minute, I am testing the power generator, filling up the bath tubes with water, covering the windows, and perhaps topping off my fuel supplies. I can focus on preparing my home for a storm, because I already have enough food to last for months and years. Food is so tremendously cheap in US and Canada, despite food inflation in the past three years. The story of Joseph in the Old Testament book of Genesis describes how he stored 7 years of grain in anticipation of a famine. The next Great Depression is likely to last 7 or more years. You have the opportunity now to store years of food for your family. When disaster strikes, the opportunity to prepare is gone. A mouthful of food to a starving person is worth more than all the gold in the world.